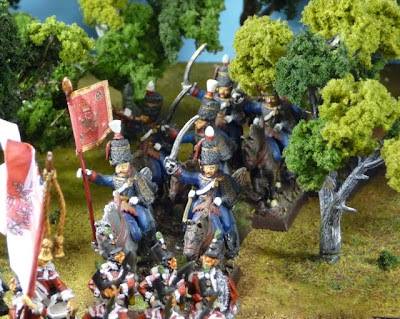 The first of my peninsular units is the famous Light Division. 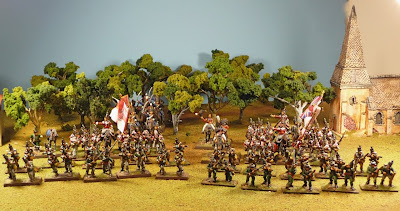 They are represented here as they were at Battle of Fuentes de Oñoro. I probably painted these units 2 years ago. Only the 43rd (the Monmouthshire Light Regiment) and the 1/2 52nd (the Oxfordshire Light Regiment) battalions have colours. Neither, the Portuguese Caçadores or the 95th Rifles carried or I think had regimental colours. 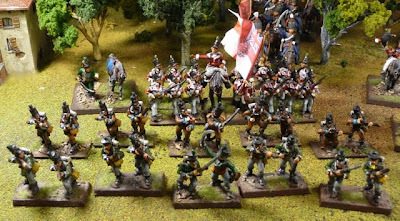 The 52nd and the 43rd are based as in battalion order (3 figures to a base) while both the caçadores and the rifles are based in skirmishing order (2 figures to a base). 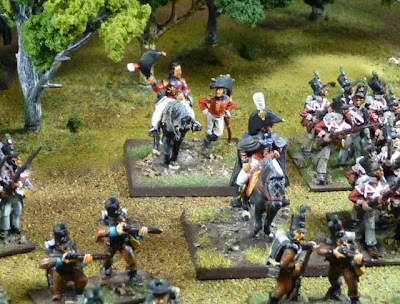 The figures of the 52nd and 43rd are from Elite Miniatures and the Cacadores and the Rifles are from Front Rank. The flags are from GMB Flags. "Black Bob" Crauford, the general in command of the Light Division. These are Foundry figures. The 2nd Brigade, under Colonel George Drummond, comprising the 1/2 battalions of 52nd Light infantry regiment. 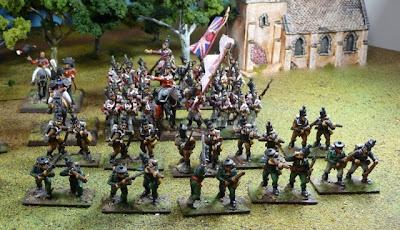 The skirmishing units are elements of 1/95th Rifles and 1st Caçadores. Close up of the 52nd. Here is the first Brigade under Colonel Beckwith, late of the 95th Rifles. The brigade was made up of the 43rd Light infantry battalion, units of the 1/2 95th Rifles and the 3rd Caçadores. And of course, the Light Brigade's usual companion; the 1st KGL Hussars. Looks good, John. Are those GW bevelled bases? Thanks, Robert. The bases are indeed GW, I used to split a 80 x 20 mm base in half and green stuff the cut edge. I then picked up a big bag of 40 x 20 mm warhammer bases which I now use. 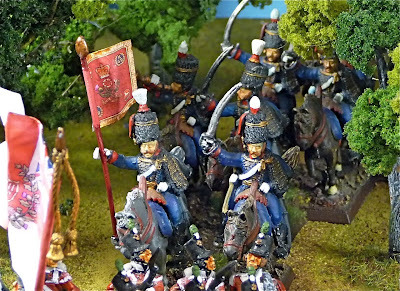 I still use the 40x40 mm GW base for command and cavalry. 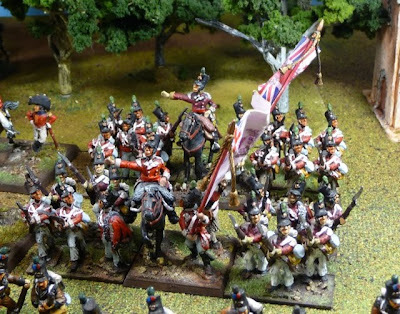 What manufacturer is that British officer leaning on his canes? It is a nice little set.